releases into a need larger than itself. Despite the fact that poetry and culture are frequently positioned as going hand in hand, there are still some cultures that seem to be shot directly into the forefront, while others await their chance. Wasps in a Golden Dream Hum a Strange Music is a collection that touches upon the immigrant experience, not so much addressing the process of coming to Canada as reaching out to bring about memories of India and Pakistan, demonstrating how the past can bleed into the present in a way that transcends any sort of assimilation. The first quarter of the collection had me searching for these kinds of memorable and saturated lines, though the main problem in the collection lay, I found, in this very same way of phrasing it: the need “to search.” Where the first quarter of the collection was more grounded to the synopsis of the book, afterward the poems seemed to scatter in every direction. There was hardly any grounding point that could keep me focused on where the collection was going, and if with the more “traditional” verse poems this was manageable, then the prose poems of this collection proved to be a different sort of beast. Chapter one is usually white. Chapter one is usually male. Chapter one is usually middle-class. Progressing further through the poems, however, it becomes difficult to focus and follow along, the prose poems becoming longer and truly more “prose” than “poem.” Ghaffar loses that pointedness that characterizes the beginning and instead seems to throw everything in all at once, requiring quite a bit of patience to work through. They reminded me of a professor who was so engaged and interested in his own topic that he’s trailed off, delving down into several layers of analysis without bringing his students along, as well, having left them to frantically scamper along. 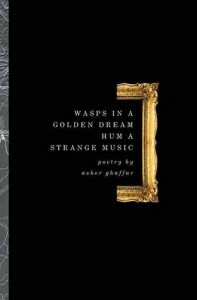 That is how a majority of Wasps in a Golden Dream Hum a Strange Music made me feel — On one hand, these are poems written by someone who is clearly knowledgeable and determined in finding ways of expressing these visions, playing with words to achieve the desired effect. On the other hand, there is an overbearing quality to these poems, a certain heaviness that makes them difficult to keep up with and, sometimes, to connect to. 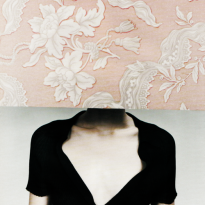 They create a barrier between themselves and the reader and remain contained in their own wordplay. They emit a strange sort of music, indeed, one that I found a bit too much for my taste.